Christie’s spring sale of American Art on May 22 will offer total of 172 lots, with outstanding works of from a range of styles and genres, including Illustration, Modernism, Western Art, Nineteenth Century and American Impressionism. This fantastic array of masterworks is led by Norman Rockwell’s The Rookie (Red Sox Locker Room) and Thomas Moran’s The Grand Canyon of the Colorado. 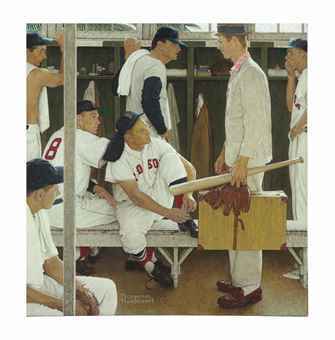 The Rookie (Red Sox Locker Room) by Norman Rockwell, which has never been offered at auction, was painted in 1957 for the March 2nd cover of The Saturday Evening Post and has remained in the same private collection for nearly thirty years. It has been publicly exhibited at the Museum of Fine Arts, Boston twice–once in 2005 and again in 2008–following World Series victories by the Red Sox. The work was painted in 1957 for the March 2nd cover of The Saturday Evening Post and has remained in the same private collection for nearly thirty years. It has been publicly exhibited at the Museum of Fine Arts, Boston twice–once in 2005 and again in 2008–following World Series victories by the Red Sox. Estimated at $20-30 million, The Rookie (Red Sox Locker Room) marks the highest estimate ever for Norman Rockwell at auction. Norman Rockwell’s covers for The Saturday Evening Post during the 1950s reflected the direction of editor Ben Hibbs, who strove to make the magazine more current to increase circulation. Nothing could be a more popular subject to an American audience than baseball and no player other than Ted Williams, “The Greatest Hitter Who Ever Lived” was commanding more attention at the time, on the eve of his retirement from baseball. Rockwell conceived this cover at least 9 months in advance of its publication date on March 2nd, 1957, just in time for the start of spring training for the Red Sox. Over the summer of 1956, he convinced team management to send four players from the starting lineup up to Rockwell’s hometown, Stockbridge, Massachusetts, deep in Red Sox country. Pitcher Frank Sullivan, right fielder Jackie Jensen, catcher Sammy White all posed for the painting. Williams was either unable or unwilling to make the trip and Rockwell captured his likeness from his trading card, and other photographs. Rockwell traveled to Sarasota to take pictures of the Red Sox spring training stadium and locker room. The palm trees which sway in the window indicate the location. The Rookie (Red Sox Locker Room) depicts an intimate scene during spring training; an awkward newcomer is juxtaposed with the confident stances of the seasoned players, making the rookie’s anxiety all the more apparent and endearing. and Willie Gillis in Church (estimate: $2,000,000-3,000,000). Christie’s sale of American Art on May 22 will feature Thomas Moran’s (1837-1926) magnificent large-scale painting The Grand Canyon of the Colorado. Painted in 1904, the work is one of Moran’s most ambitious oils of the subject from the period. This canvas presents an awe-inspiring panorama and manifests Moran’s romantic and inspirational vision of the American West. The Grand Canyon of the Colorado, which has been exhibited at both the Royal Academy in London and the National Gallery of Art in Washington D.C., has not been offered for sale in over two decades. At $8-12 million, this is the highest pre-sale estimate assigned to a work by Thomas Moran at auction, reflecting the superb quality and rarity of this masterwork. The Grand Canyon of the Colorado is a masterwork of Moran's mature style and represents the artist at the height of his abilities. Although he visited the Grand Canyon many times and created multiple of images of the geologic wonder over the course of five decades, few are as richly complex or as monumental in scale as this painting, which captures the sublime beauty of the area in its expanse of rugged peaks and atmospheric valleys. Throughout, he employs his characteristic keen attention to light, color, and detail and the high vantage point underscores the vastness of the Canyon. Moran studied at a time when the strict realist theories of John Ruskin were lauded and, though adhering to the auspices of precise geologic transcription, it is evident that he was far more interested in capturing and conveying the emotional effect the landscape inspired. which sold at Christie’s in 2008 for $17.7 million, against a pre-sale estimate of $3.5-5 million. In addition to setting a record for the artist, it also set the record price for any 19th century work of American Art at auction.